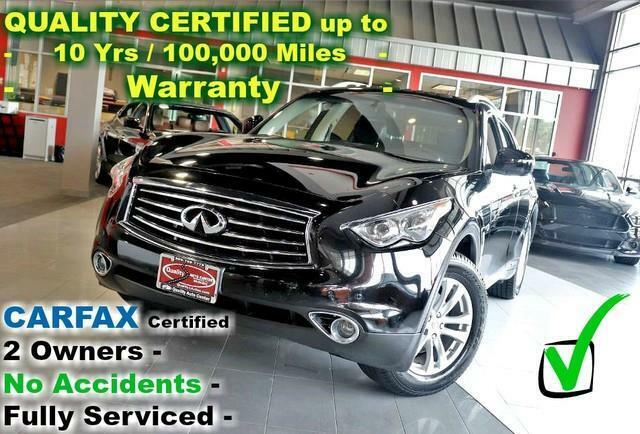 Contact Quality Auto Center today for information on dozens of vehicles like this 2015 INFINITI QX70 AWD - CARFAX Certified 2 Owners - No Accidents - Fully Serviced - Quality Certified w/up to 10 Years 100,000 Miles Warranty. This INFINITI includes: BLACK OBSIDIAN [NONRD] RADIO: INFINITI HARD DRIVE NAVIGATION SYSTEM Navigation System CD Player GRAPHITE, LEATHER-APPOINTED SEAT TRIM [P01] PREMIUM PACKAGE [H01] TECHNOLOGY PACKAGE *Note - For third party subscriptions or services, please contact the dealer for more information. * Certified Pre-Owned means certified peace of mind. If you're in the market for an incredible SUV -- and value on-the-road comfort and manners more than ultimate off-road prowess or tow capacity -- you'll definitely want to check out this INFINITI QX70 AWD - CARFAX Certified 2 Owners - No Accidents - Fully Serviced - Quality Certified w/up to 10 Years 100,000 Miles Warranty. For those who are ready to drive something more than just a car, this INFINITI QX70 AWD - CARFAX Certified 2 Owners - No Accidents - Fully Serviced - Quality Certified w/up to 10 Years 100,000 Miles Warranty will appeal to their idea of luxury and refinement. This AWD-equipped vehicle handles well in any weather condition or terrain. You'll benefit from superb handling, improved steering and excellent acceleration. In addition to being well-cared for, this INFINITI QX70 has very low mileage making it a rare find. This INFINITI QX70 offers the most up-to-date navigation system available so you'll always know the most efficient route to where you are going. Added comfort with contemporary style is the leather interior to heighten the quality and craftsmanship for the INFINITI QX70 More information about the 2015 INFINITI QX70: The 2015 QX70 manages to package sport-sedan performance into a crossover utility vehicle package. But what really separates them from the rest of the performance-SUV crowd is that they really look the part, with curvy sheet metal and an aggressive stance. Both of these models handle far better than most other so-called performance utility vehicles. The other aspect that truly distinguishes the QX70 models is available technology. A long list of optional items are available that otherwise might only be offered in big sedan flagships, such as the Mercedes-Benz S-Class or BMW 5-Series -- including items such as lane-departure warning, collision-avoidance braking and intelligent cruise control. This model sets itself apart with Strong performance, comfortable seats, high-tech options, beautiful exterior design, luxurious, well-trimmed interior, and all-weather ability No Credit / Bad Credit / No Paystubs, No problem !! ! All Approved ! Everyone drives ! CLEAN, GORGEOUS, LOW MILES, SHOWROOM CONDITION. CALL NOW QUALITY CERTIFIED up to 10 YEARS 100,000 MILE WARRANTY , To Certify a vehicle, there will be an additional cost for Certification. CALL NOW For details. STUNNING AGGRESSIVE LOOK ON THIS BEAUTIFUL--Call today to schedule a test drive... Good Credit/Bad Credit/No problem!!!! Get paid cash? No problem!! 100% Credit Approval with interest rates starting at 2.49% for qualified customers, our rates will not be beaten. We price our cars at wholesale price to guarantee the best deals for our customers. Our inventory moves quick, please call to confirm the availability of the vehicle of your interest Springfield location 973-564-0112. This vehicle is located at our SPRINGFIELD location. Come visit our new showroom in Springfield NJ.